Yesterday, Chicago Transit Authority President Forrest Claypool sat down with representatives from local Chicago transportation blogs, including ChicagoBus.org, CTA Tattler, and Grid Chicago. One of the key points discussed during the meeting was the CTA’s plans for bus rapid transit (BRT). The CTA is currently in the early planning stages for BRT routes in the Central Loop, along with the Western and Ashland corridors. Later this year, the CTA intends to launch its first foray into Bus Rapid Transit along Jeffery Boulevard. But Claypool expressed reluctance in classifying the Jeffery Route as BRT. Claypool said that the CTA is looking forward to learning from the Jeffery route and incorporating those lessons into the planning processes for the Western and Ashland BRT corridors and the Central Loop BRT. 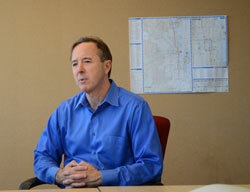 In addition to BRT, Claypool discussed other plans to improve bus service systemwide. He referenced early stage studies on improving bus routes on both north and south Lake Shore Drive. Additionally, Claypool talked about working more closely with the Chicago Department of Transportation.